Rhodes is the largest of the Greek Dodecanese islands and known for its ancient ruins. It’s one of the most beautiful Greek islands with low mountains and picturesque beaches. 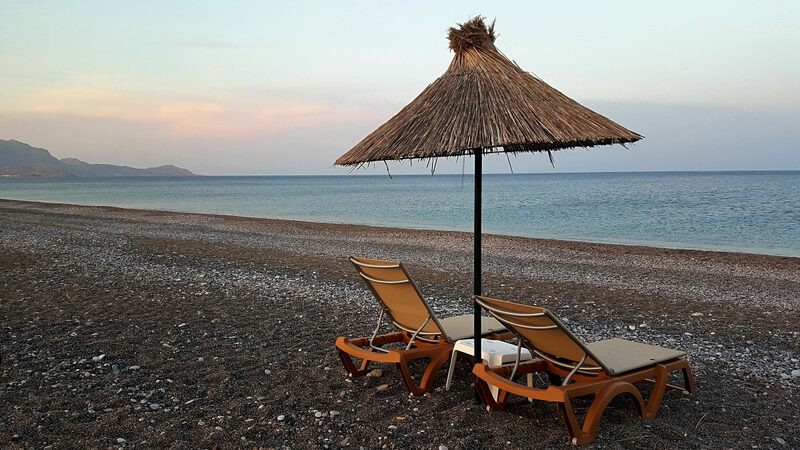 In the quiet village of Kalathos, you’ll find the 5* beach front Atrium Palace Resort. I spent seven nights at this luxury resort in May. 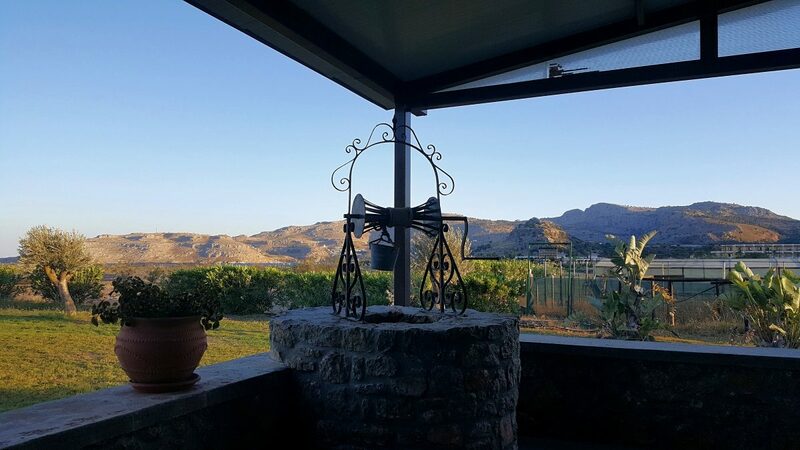 It’s the perfect place to relax and unwind, and due to the location, it’s a great starting point to explore all that Rhodes has to offer. 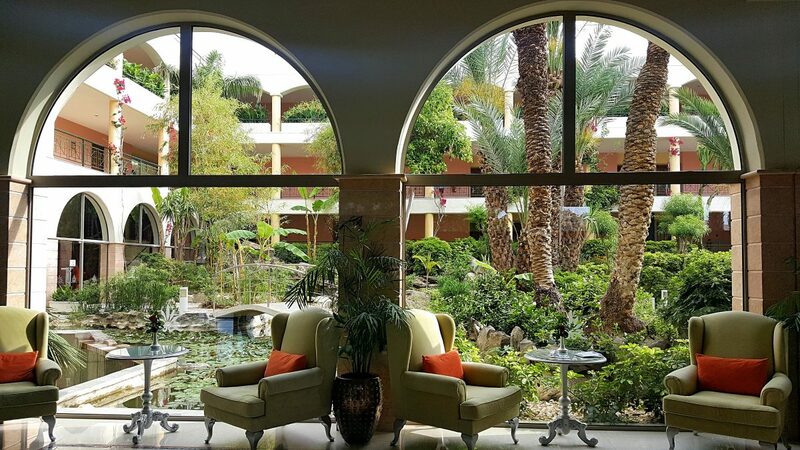 I’d describe the Atrium Palace Resort as a tropical paradise, a luxurious oasis where you can step into another world and forget about your worries. 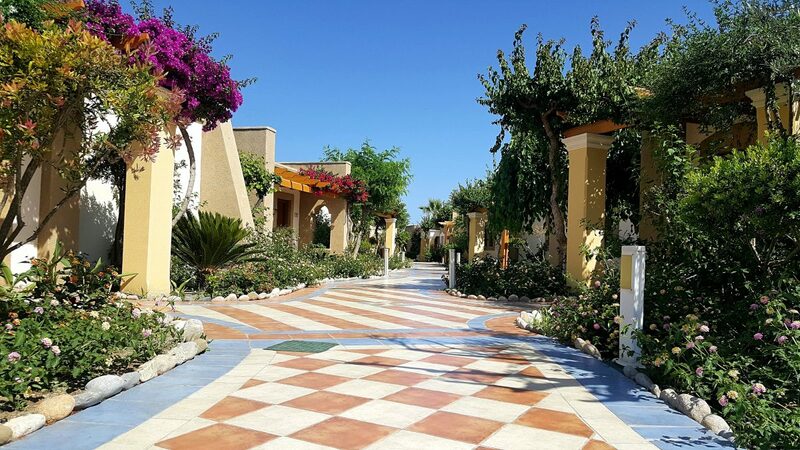 The resort grounds are beautiful with lush gardens, palm trees, and six stunning outdoor swimming pools. It’s only a short stroll away from the beach. 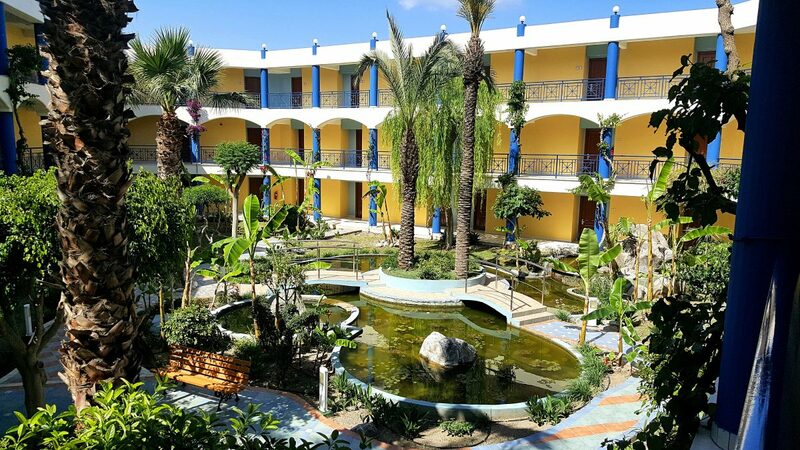 The resort has three restaurants serving both local and international cuisine as well as four bars. The onsite shop is reasonably priced and a great place to buy local specialities including drinks, spices, and olive oil products. You can also relax and enjoy the facilities at the Thalasso Spa for an extra fee. 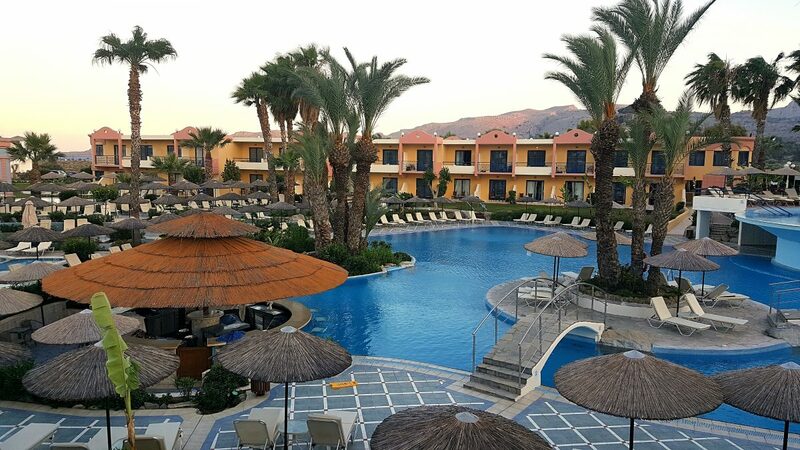 The hotel staff members are exceptionally friendly and hospitable, eager to help and always greeting you with ‘Kalimera’ or ‘Kalistera’ depending on the time of day. They made me feel welcome. Upon check-in, I received a welcome drink. 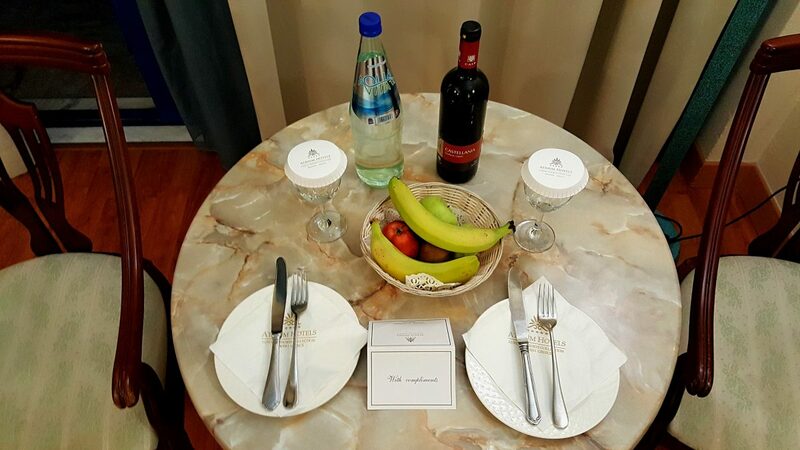 Also included in my stay was a great complimentary welcome basket filled with fresh fruit, sparkling water and a bottle of local red wine. I stayed in a double room with a garden view. 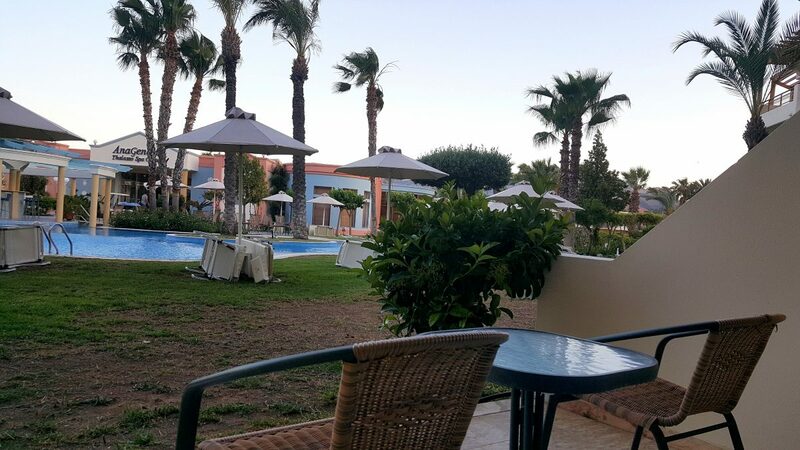 My spacious room was located on the ground floor, with a small patio overlooking a pool and the Thalasso Spa. 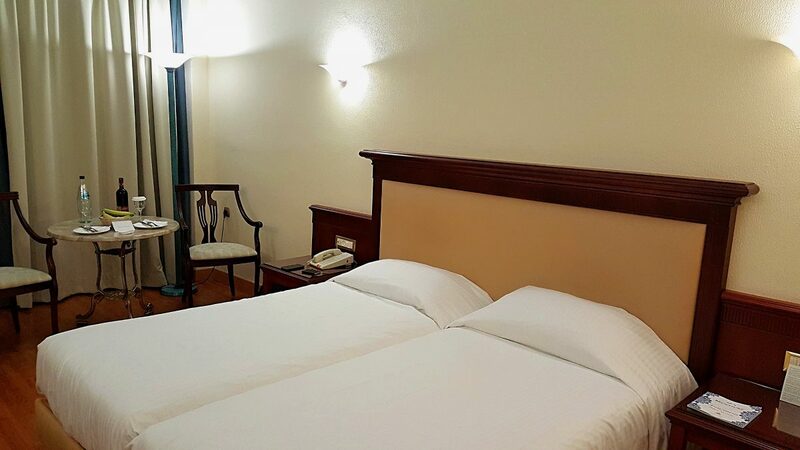 You can expect to find all the standard facilities inside the room including air-conditioning, TV, and mini-bar. A comfortable pair of slippers and bathrobe is also provided. If you love coffee, then you’re in for a treat! Each room has a Nespresso machine and you receive four complimentary pods every day. I’m more of a tea drinker myself, so opted to make myself a cup of tea instead. Although the en-suite bathroom is small, the bathtub is fitted with jets. So essentially, you have your own private hot tub! 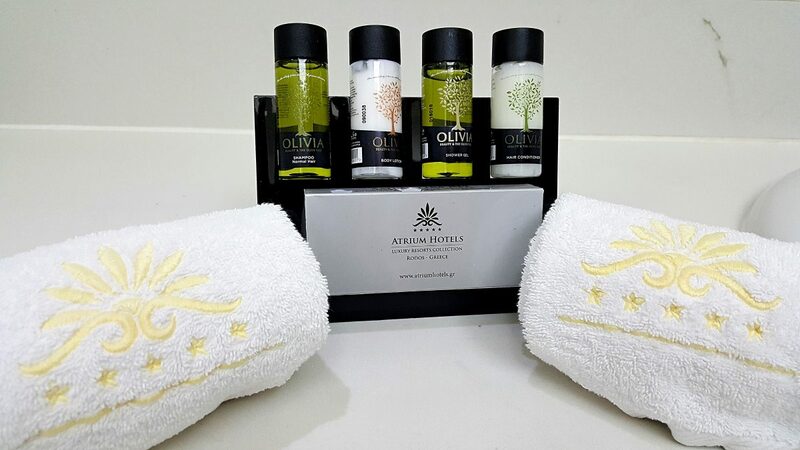 Complimentary natural olive oil toiletries are included and replenished every day. When it comes to enjoying the local and other international cuisines, you can choose from three onsite restaurants. 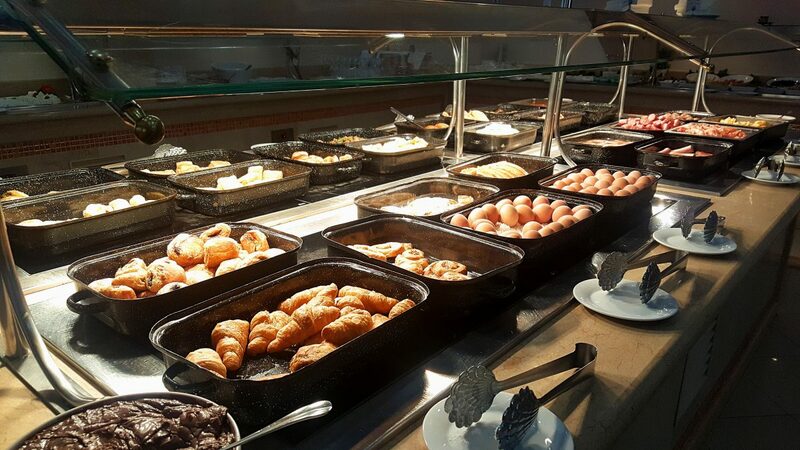 Symposium is the main restaurant where breakfast is served every morning. 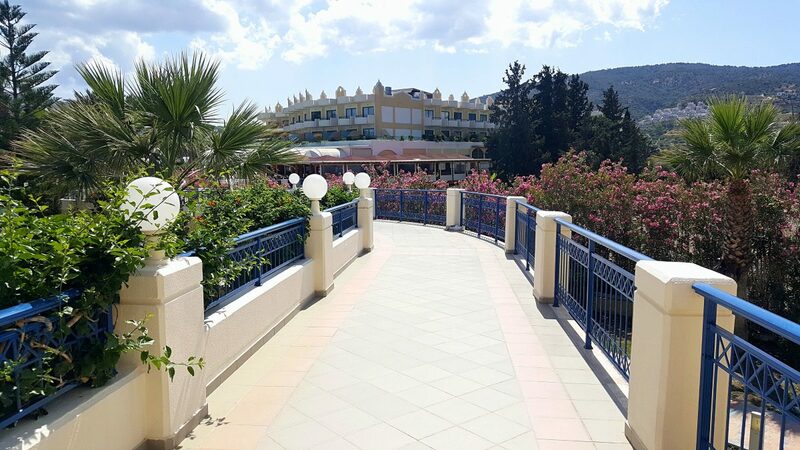 You can enjoy lunch or dinner at Poseidon Pool a la carte Restaurant while Asterias a la carte Restaurant serves Greek and international specialities. 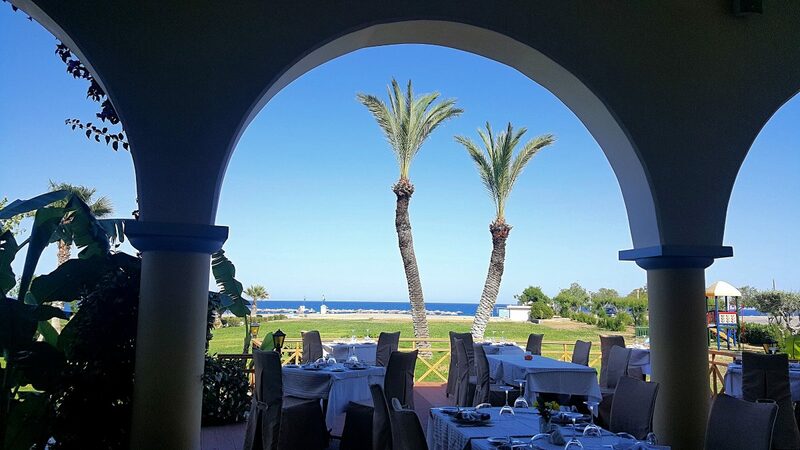 As an added bonus, Asterias has a terrific view and is open for lunch and dinner. If you’ve been reading my blog, then you’ll know how I feel about breakfast. I absolutely love it and the decadent breakfast buffet at the Atrium Palace Resort did not disappoint. 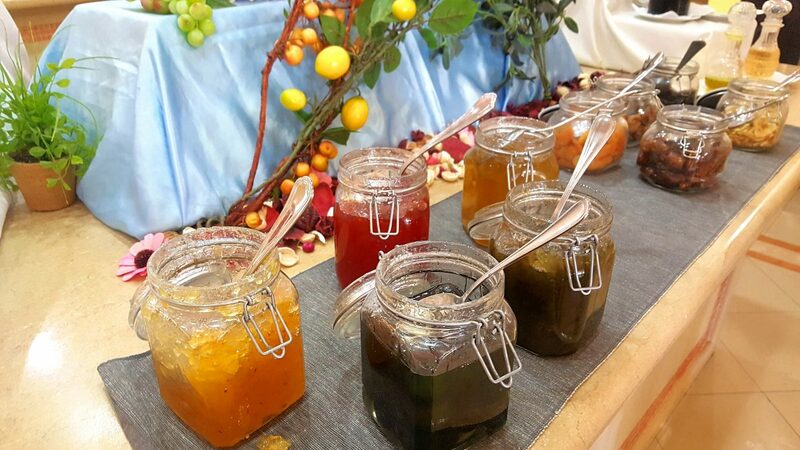 You’ll be spoiled for choice as the buffet includes everything from fresh fruit, homemade preserves and creamy Greek yogurt to pastries, salads, grilled vegetables, meat, and fish. Eggs and pancakes are cooked to order. What was the best part for me? 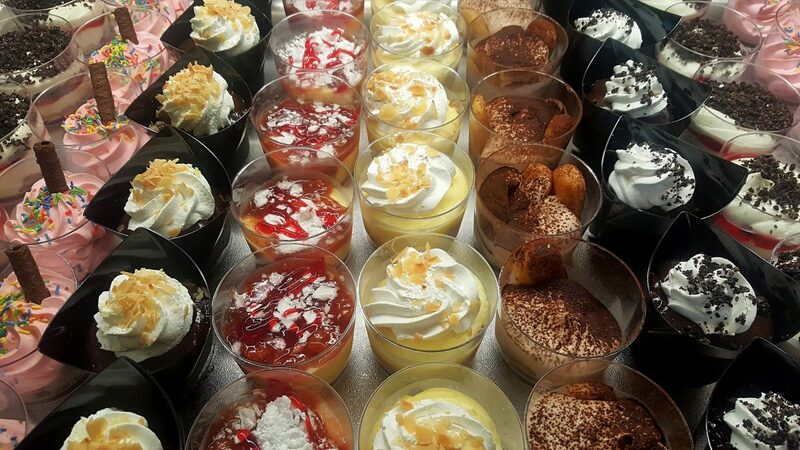 You might have guessed it…the desserts! Now, normally I don’t eat dessert for breakfast, but in this case, I made an exception. I am, after all, on holiday…Halva, baklava and my favourite, kataifi. After seeing the extensive buffet at Symposium, I decided to dine at the restaurant for one evening. 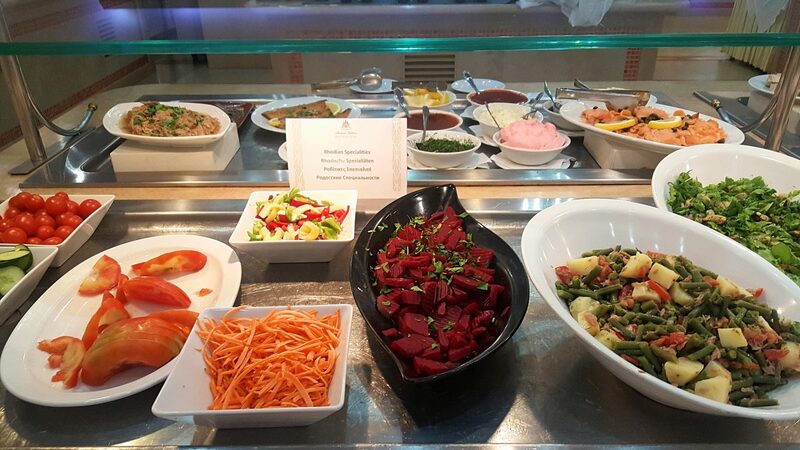 The dinner buffet has everything from fresh fruit and cheeses, a variety of salads and grilled vegetables to an assortment of meat and fish. But my favourite part was the dessert buffet. I couldn’t get enough of the baklava and kataifi. 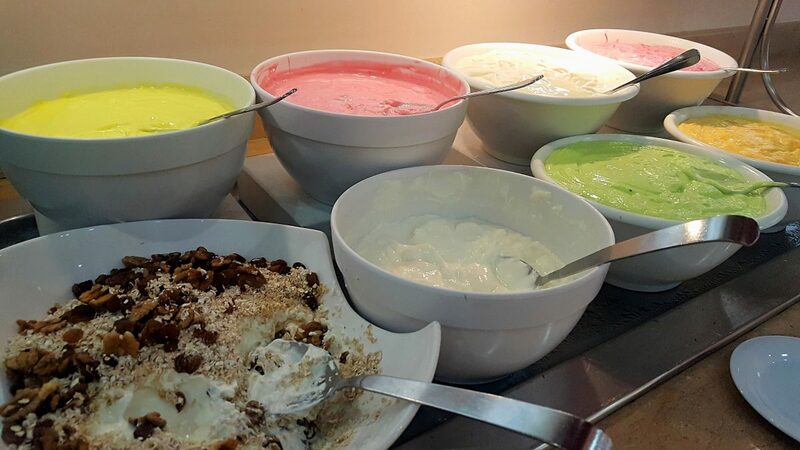 I really enjoyed the variety of food choices that come with a buffet. 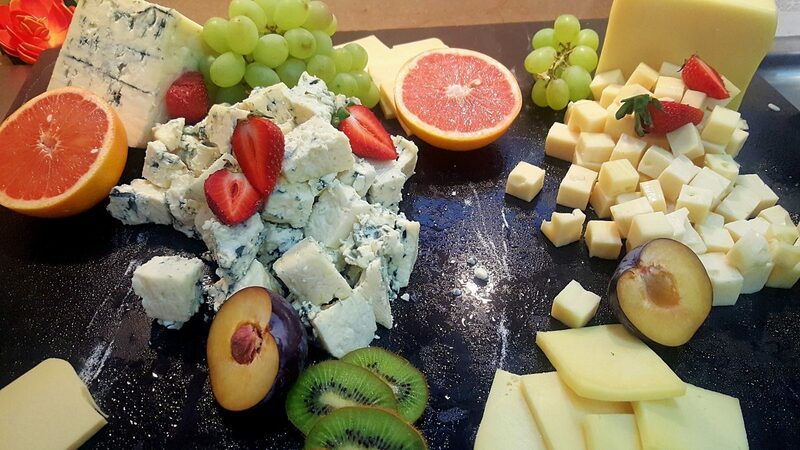 But for me, food freshly prepared and made to order will always be tastier. The town of Kalathos is very small, with only a couple of shops and restaurants. It’s a great place to break away from a busy life and just wind down and relax. There are three restaurants around the hotel that I highly recommend. My favourite was Ostria. The food is delicious, the service great and the view fantastic. 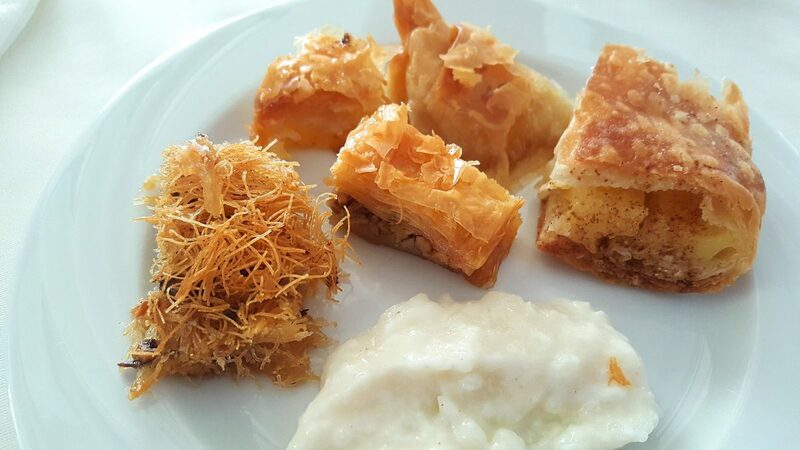 I always received something complimentary with every meal, be it a bottle of water, a piece of baklava or a glass of ouzo. 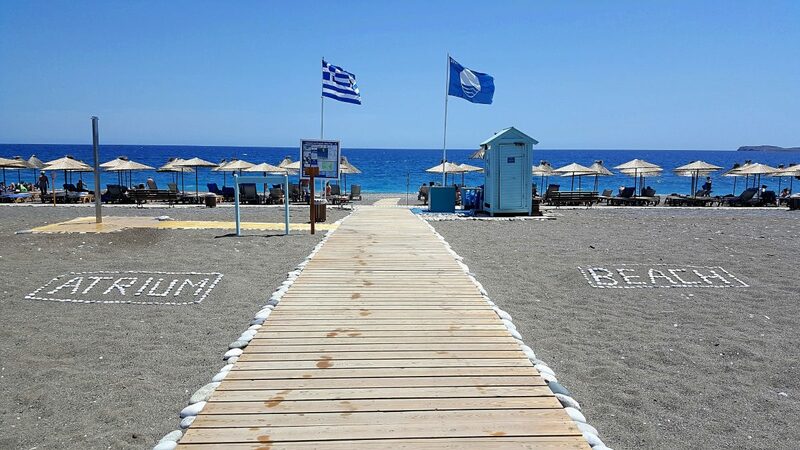 They also have the best beach bar where you can relax and enjoy a few drinks. 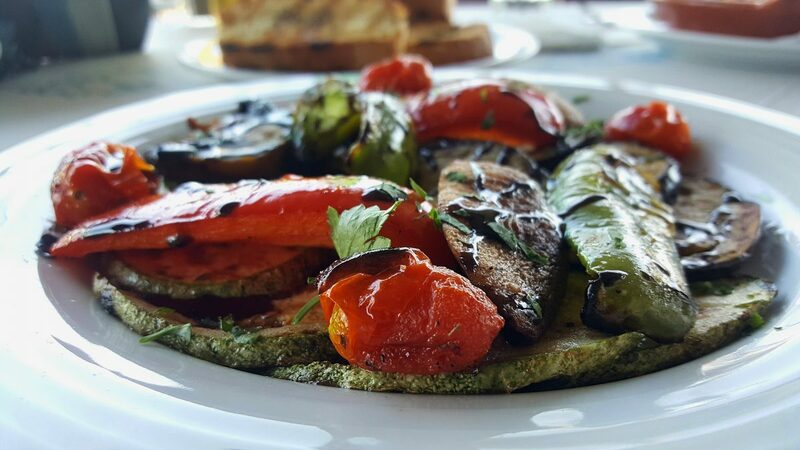 Two other restaurants worth checking out are Konstantin Restaurant Café and Restaurant Stefanos. 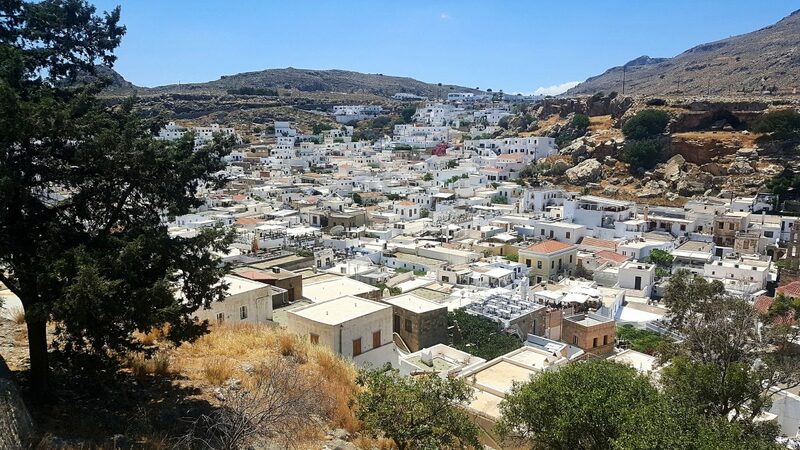 The beautiful fisher village of Lindos is only 6 km away from the resort and can easily be reached with a public bus or rental car. Lindos is lively with lots of shops and eateries and two beautiful beaches. Read more here about why you should visit Lindos. Besides the great breakfast buffet and the wonderful staff members, the best feature of the resort for me was, without hesitation, the beach! It’s a great beach for swimming or just to soak up the sun. The lounge chairs are super comfortable, the umbrellas keep the sun out of your eyes and the beach is clean. I went for a swim every day. I’m not lying when I say that my stay at the Atrium Palace Resort was perfect! 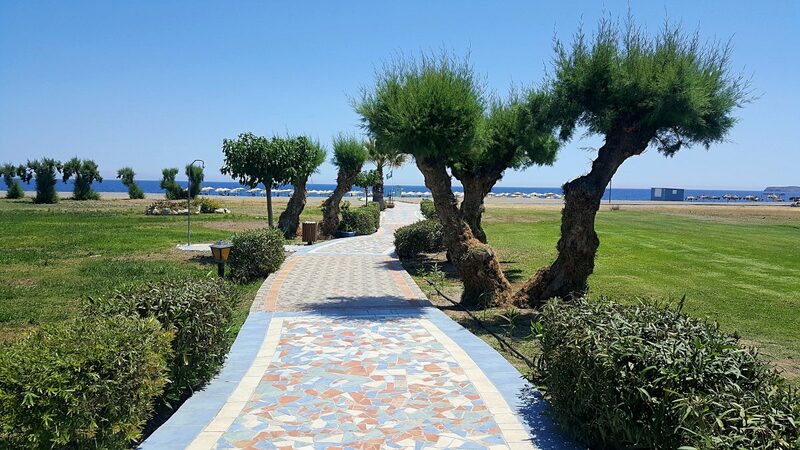 I cannot fault anything and I highly recommend staying here the next time you travel to Rhodes. In fact, I left the resort feeling rejuvenated but also with a heavy heart, wanting to stay another week. I’m a travel fanatic, nature lover, geek, metalhead, and writer. My promise to you: transparency, depth, and passion. Keep it real and stay weird everybody! I’m a South African expat currently living ‘the European dream’ in Amsterdam. 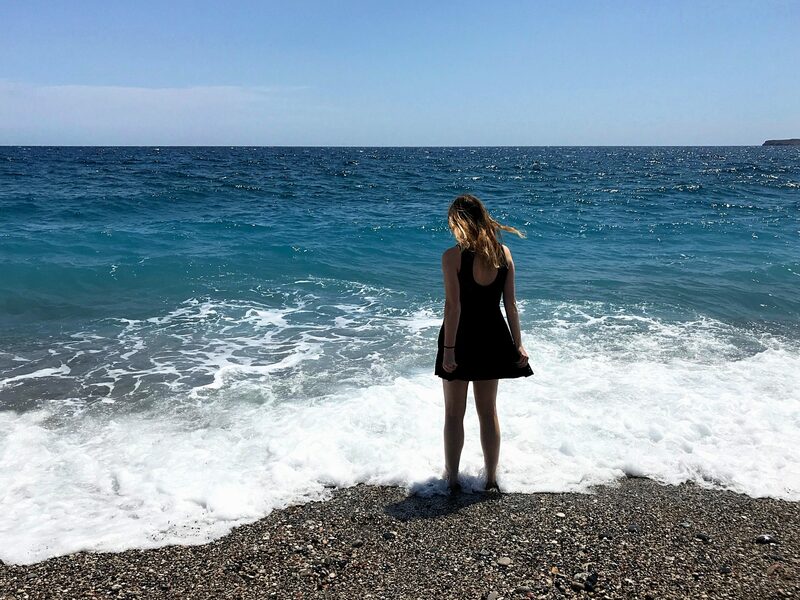 Follow my adventures around the globe as I write about places and faces, indulge my sweet tooth, take photographs and advocate for animal welfare. Feline infestation: what’s up with all the cats in Cyprus? @2019 - Sonja Faul aka Sightseeing Scientist. All Rights Reserved.